Seeing that I am spending so much time in bed with my NyQuil I began feeling sorry for myself today and looking at pictures of great musicians on their deathbeds. It made me feel better! And I would rather look at musicians on their deathbeds than read about my Facebook friend Governor Paterson's taxes. That is for sure. 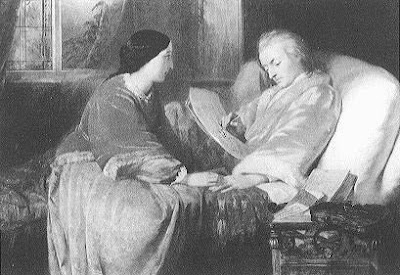 There are a hundred pictures of Mozart on his deathbed. He had arguably the most famous deathbed of all time. The one up at the top of the post is my favorite. I love all the commotion, everyone standing around, women weeping over him, kids in the picture, someone at the piano -- playing the Requiem, no doubt. The story has it that when Mozart was dying he was directing people on how to complete the Requiem. 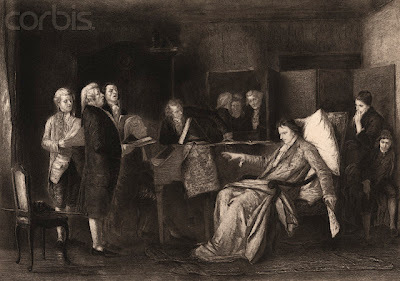 Here is a picture of Mozart on his deathbed that I never saw before. 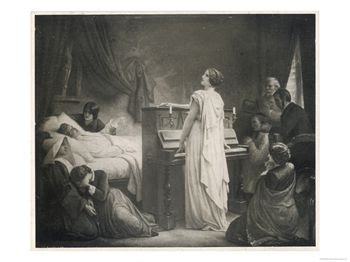 This vision of Mozart's deathbed is kind of dark for my tastes. Isn't this fun? Where else would you find this? Everywhere else you look today, people will be talking about boring stuff like our taxes and government spending. But we are talking about musicians on their deathbeds. 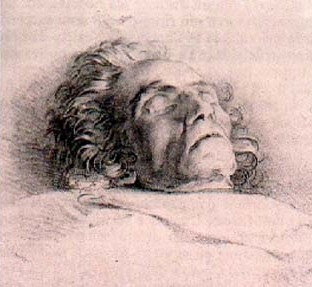 There is a beautiful picture of Chopin on his deathbed. That looks like the piano I have in my dining room! And that is me playing it. This calls out for music! Here is Chopin's famous Funeral March as only Leonard Pennario could play it. You get the best deathbed pictures when the dying person is young. Chopin was something like 39 when he died. So was Mendelssohn. 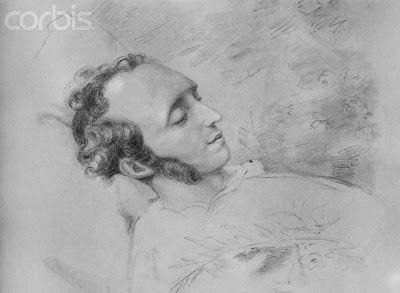 Here is a famous drawing of Mendelssohn on his deathbed. 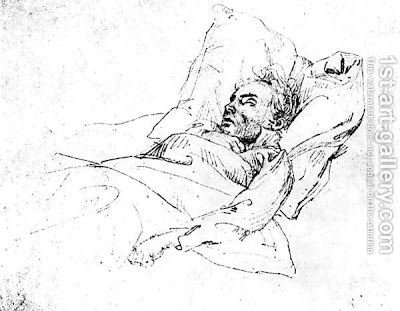 Here is a picture I found of Beethoven on his deathbed. 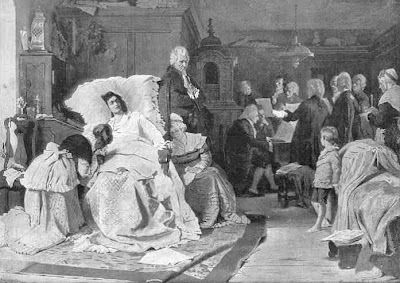 Here is another picture of Beethoven on his deathbed. It is by Josef Eduard Teltscher, 1801-1837. Poor Josef Eduard Teltscher, he did not live to be very old himself. On the Web this picture is accompanied by the greatest sales pitch. "Why settle for a paper print when you can own a real handmade oil painting on canvas? Order your handmade reproduction of Ludwig van Beethoven 1770-1827 on his deathbed, 28th March 1827 today!" Ha, ha! I love that. I wish I lived in the 19th century because back then you could do great things with your hair. 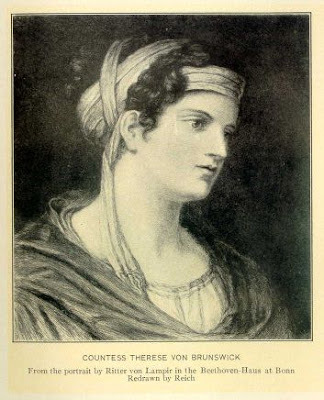 Looking for deathbed pictures of Beethoven I found this picture of his buddy the Countess Therese von Brunswick. His girlfriend Toni Brentano went for an even wilder look. 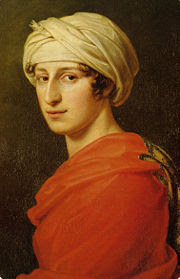 Imagine if you could bind your hair into a turban like this and go to work! Would that be great or what? How did I get onto hairstyles? I thought I was talking about deathbeds. I hope I don't see my own death bed too soon!!!! Deathbed deconversions happen all the time. Ilyn, tell me about a deathbed deconversion!